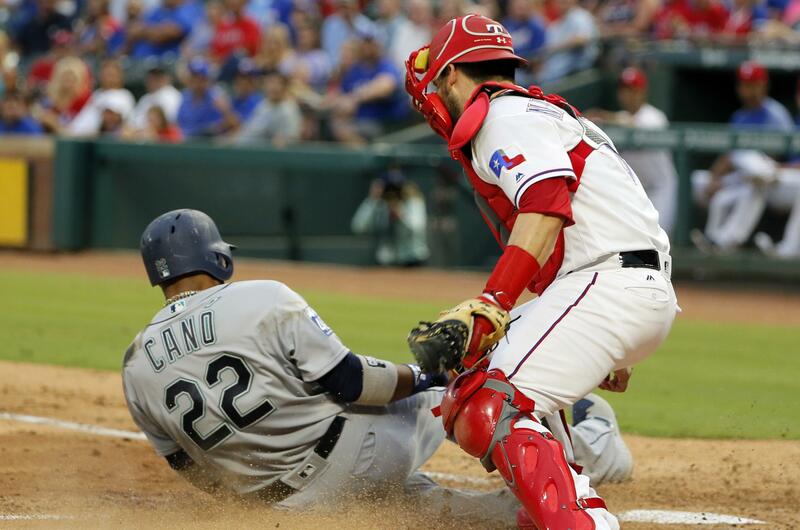 What happened: Robinson Cano doubled twice to drive in three runs and the Seattle Mariners beat the Texas Rangers 8-7 on Tuesday at Globe Life Park in Arlington, Texas. Cano finished 2 for 4 and scored. The play of the game came in the eighth, with the Mariners clinging to a one-run lead. Delino DeShields tried to go first-to-third on a single to center by Nomar Mazara, but Jarrod Dyson unleashed a perfect throw to nab DeShields for the third out of the inning. Nelson Cruz hit his 22nd home run of the season and went 2 for 5. Dyson, Danny Valencia and Leonys Martin all added two hits apiece, and Martin drove in two. In his first start in his second tour of duty with the Mariners, starter Erasmo Ramirez was strong through three innings before running out of gas in the fourth, allowing massive home runs by Rougned Odor and Joey Gallo. Overall, Ramirez gave up three runs on five hits, with no walks and five strikeouts, over 3 1/3 innings. He threw 58 pitches, 42 for strikes. M’s DH Nelson Cruz led off the second with a line-drive homer, his 22nd of the season. Danny Valencia lined a one-out single to center and went to second when Carlos Gomez misplayed it. A wild pitch allowed Cruz to move up to third and he scored on Leonys Martin’s single to right. The offense went back to work in the third. With one down, Jarrod Dyson singled, stole second easily and went to third when a pickoff attempt skipped into centerfield. Robinson Cano doubled to right to plate Dyson. With two down, Kyle Seager walked and Valencia stroked a single to left and Cano beat the throw home. Martin then singled to right to bring in Seager for his second RBI of the game. Texas got on the board against Ramirez in the fourth. Adrian Beltre reached on a throwing error by shortstop Danny Espinosa and Rougned Odor followed with an upper-deck blast for a two-run shot, his 24th of the season. An out later, Joey Gallo mashed one to straight center into the fake facade above the upper deck, his 26th, measured at 456 feet by Statcast. With Ramirez on a 60- to 80-pitch limit, manager Scott Servais came out to get him after the second homer, two outs shy of qualifying for a win. The M’s scored three times in the sixth to go up 8-3. With one down, Mike Zunino doubled and Espinosa walked. Gamel flied out for the second out, but Dyson lashed a single to center and Zunino scored with Espinosa moving to third. Cano followed with a double to plate both. It was Cano’s 499th career double. The Rangers got those three runs back in the bottom half off Casey Lawrence. Odor and Mike Napoli singled ahead of Gallo’s second homer of the game, his 27th of the season. In the seventh, Tony Zych replaced Marc Rzepczynski with one down and immediately hit Beltre. Odor’s grounder to second forced Beltre and it appeared Napoli flied out to end the inning. But Zych was called for a balk on the pitch, so Odor moved up a base and Napoli had a second shot. He didn’t waste it, singling up the middle to bring Odor around to score. Servais asked for James Pazos to face Gomez. Pazos hit Gallo with a 3-1 sinker. Servais switched again, this time to Nick Vincent, who struck out Gomez on three pitches. In the eighth, Shin-Soo Choo singled with one out and was pinch-ran for with Delino DeShields. Elvis Andrus popped out, then Nomar Mazara singled. Dyson threw a seed to third and nailed DeShields trying to advance. Cano walked to lead off the ninth, then with one out went to third on Seager’s double into the right field corner. Valencia bounced one to third and Cano was gunned down at the plate. The Mariners are one of seven A.L. teams with a winning record. Let that sink in. At 55-53 they are 1 1/2 games out of a wildcard spot. They have a tough road ahead, playing only seven games at Safeco in August but it they can survive that, they’ll have a puncher’s chance in September playing just two teams with winning records – Houston and Cleveland. Hero: Jarrod Dyson. His ninth outfield assist of the season was one of the plays of the year. Goat: Danny Espinosa. 0 for 3, throwing error, missed catch. Seattle Mariners (55-53) at Texas Rangers (50-56) on Wednesday at 5:50 p.m. at Globe Life Park in Arlington, Texas. LHP Ariel Miranda (7-4, 4.31) faces RHP Andrew Cashner (6-8, 3.48). Dyson isn’t known for his defense. Well, that’s not entirely accurate. His speed makes his defense pretty darn good. But the arm he displayed yesterday was a bit of a surprise and probably saved the 8-7 victory. … Ramirez’s start wasn’t anything to email home about. … Are the M’s going to get going now? … Gallo's first home run went a long ways. … Is Adrian Beltre about to leave the Rangers? … This is what a clubhouse needs this time of year. Published: Aug. 1, 2017, 9 p.m.